★Trade Day　※Not open to the public. Be among the first to set eyes upon new and recent releases in all of the Tamiya product ranges by visiting the show! 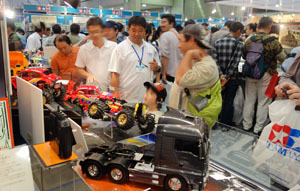 From completed versions of model kits to rare sights such as items still under development, the All Japan Model & Hobby Show is a great chance to see what wonders Tamiya has in store. What’s more, development staff will be on hand to explain their products and answer any questions you might have. Add to that the shopping corner which will have Tamiya products on sale including limited edition event items, and this is a chance not to be missed. We look forward to seeing you at the show! First announced tentatively at this May’s Shizuoka Hobby Show, this stunning model of the famous aircraft will be appearing at the show. Tamiya designers pored over actual F-14As at a number of locations in the U.S. to make this a superbly accurate kit, complete with moving recreation of the variable sweep wings. It promises an intuitive, logical and highly involved build. Parts are included to recreate 267-gallon drop tanks and 3 varieties of air-to-air missile, as well as 2 authentic scale figures and 3 marking options including those for 2 U.S. Navy aicraft and 1 Iranian IRIAF jet. ★Length: 398mm, Max wingspan: 408mm. This Mini 4WD PRO model depicts the car seen in the famous Japanese Mini 4WD manga “Hyper Dash! Yonkuro!” from the CoroCoro Aniki magazine. Its design has roots in the classic Dash-2 Burning Sun, brought up to date by arch-designer Hiroyuki Takei and including twin fenders that jut forward with style. The MA Chassis is a speedy, easy-to-maintain base. ★White large-diameter 4-spoke wheels are paired with slick tires. ★Metallic stickers for decoration, plus double shaft motor included. ★Gear ratio = 4:1. This powerful air compressor is compatible with the range of Tamiya airbrushes and provides high pressure air output (0.4MPa) suitable for quality paint jobs on large surface areas or applying gloss coats. It also features a pressure regulator with display to allow adjustment of output for fine paint jobs. 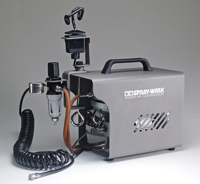 The included airbrush hanger works with its hanger switch to act as a shut-off, turning on the compressor when the airbrush is removed, and off when the airbrush is replaced again. Also included are a handy clamp and necessary hoses. ★This product is for use with 100V (50/60Hz) AC power sources only. It is compatible with separately sold Tamiya HG and Airbrush Lite series products. This entry was posted in Event Report, Future Releases on August 24, 2016 by admin.